A lack of collection development tools can hamper school and public librarians' efforts to make book collections ethnically inclusive. 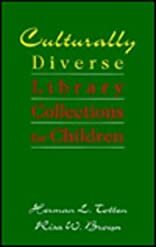 This single source bibliography is divided into four sections-- African American, Hispanic American, Asian American, and Native American-- to help school library media specialists diversify their collections. All books are listed with full bibliographic data, suggested ages or grades, and a brief annotation. Categories covered are nonfiction, biography, folk tales, and fiction, as well as relevant reference books and scholarly works. About Herman L. Totten (Author) : Herman L. Totten is a published author. A published credit of Herman L. Totten is Culturally Diverse Library Collections for Children. About Risa W. Brown (Author) : Risa W. Brown is a published author. 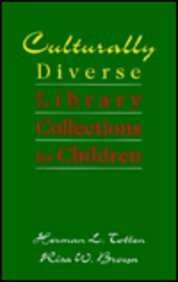 A published credit of Risa W. Brown is Culturally Diverse Library Collections for Children.